I love Thursdays, they are possibly my most favorite day of the week..why? well first of all during September through May my favorite show is on Thursdays -- hellooooo -- Grey's Anatomy!! Also, every time I have an extra special, wonderful, out-of-the-ordinary day..you guessed it..its on a THURSDAY! It might also have to do with the fact that it is almost the end of the week and sets off the excitement for Friday and the weekend. one of many actually..they keep on breeding! I feel like lately my following is continuing to grow, which I am so happy and thankful for! I find myself wishing for more and more people to find my blog and read what I have to say, and though it's a wonderful thing to hope for, I don't want to get too ahead of myself. I have been trying lately to be greatful for what I already have and appreciate all the good in my life already. Too often I expect way too much of the future and end up hugely a tad bit disappointed. I know its great to be optimistic, but there is a difference between that, and getting my hopes up too high. But to my new readers -- welcome and enjoy! This morning for breakfast I tried chobani yogurt for the second time around, because I've seen it so many times throughout the blogging world, I thought I'd give it another chance. The first time I tried the blueberry -- it was good, but it looked a little iffy. The second trial I tried the plain chobani mixed with berries, some PB&Co., and some Kashi Go Crunch. I'm thinking if I give mr. plain chobani any other chances, I'm mixing him with either more PB or some honey because it was kinda bitter. And next time maybe I should try a different mix all together. Holler at me if you have any better suggestions for a better breakfast combo! The cottage - what a cute place!! 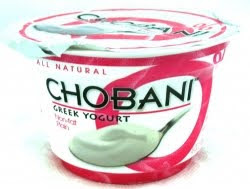 I've never been a fan of chobani either - maybe I need to give it another chance....I love Fage though. It's always a fun read, even if you're just rambling about something. I love that yogurt! Try the strawberry flavor!